I am always looking for interesting salad recipes to eat during the summer. This recipe is an absolute delight. I found it in a Sainsburys Magazine but, even with an extensive search, could not find a link on their website so I have written it out in full below. 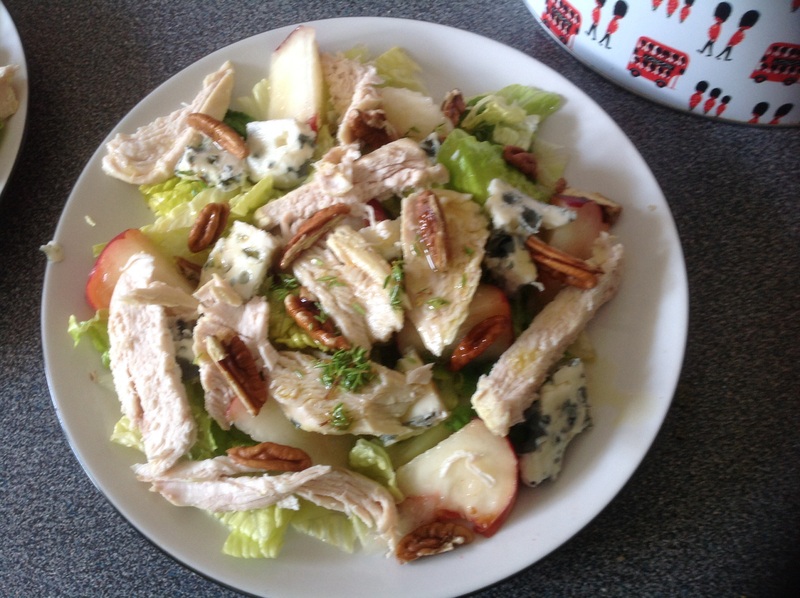 I would never have dreamt of putting chicken, blue cheese, pecans and peaches together in one salad, although I have made salads with a combination of some of these flavours. This is also the first time I used honey in a salad dressing and I was very nervous that the overall effect would be too sweet. I need not have worried. The saltiness of the cheese was a perfect complement to the peaches and dressing and the pecans and chicken made for a great variation in textures. My husband loved it so I am sure we will be having this again. Be sure that the peaches are ripe as the hard ones have little flavour and will not be sweet enough for the overall effect. If you measure the honey after the oil it will slide off the spoon easily. Divide the lettuce between two plates and scatter with the peaches. Crumble over the cheese and scatter with the chicken (cold) and pecans. In a small bowl whisk together the thyme, vinegar, oil and honey. Season with salt and black pepper the drizzle liberally over the salad.